Tonight a friend who lives nearby, and who I haven’t seen in a while, came over to spend time because there’s been some violence in their house and they are feeling unsafe there. 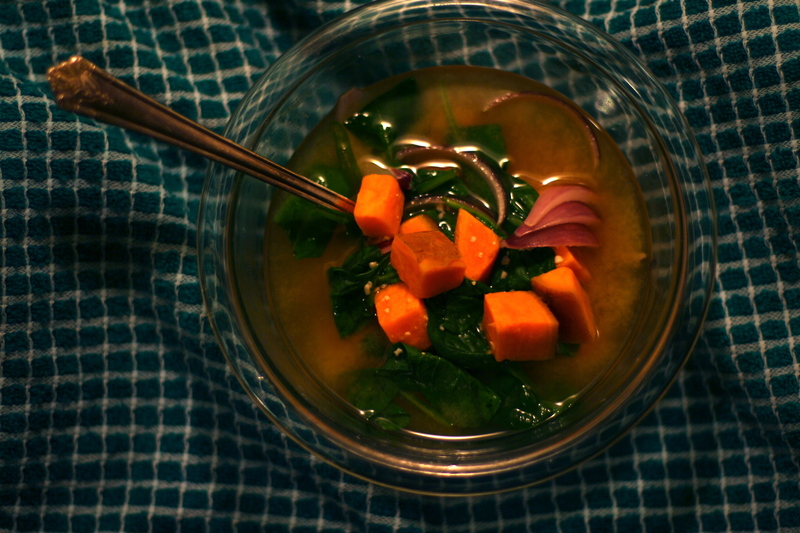 After we talked and drank tea and worked quietly at our computers, they left and I made myself an easy dinner: miso soup with sweet potato, spinach, and red onion. It reminded me of this poem, shared with me a few years ago. It sounds appealing, in a way, to melt into the “woods of the pines of the fields,” to become free from suffering by squarely facing pain, by knowing pain intimately, every day. To be “called a nobody by everyone;” to barely exist; to exist as friendly landscape, as natural shelter. But is there a place here for community of emancipation? Problems in this poem are either small enough to impact as an individual (through personal sacrifice, like The Giving Tree), or so huge (pre-industrial weather, no thought of a ‘climate change’ to reverse) that there is nothing to be done. What about the problems in the middle? Small enough that human action can have some impact, but big enough that it takes many many many humans, properly coordinated, to do it? Isn’t that another way of feeling like a “nobody?” Seeing patterns of harm, knowing they can be stopped, but being unable to do it yourself, or even with your intrepid cohort? I know the point is an attitude, an orientation toward the inevitable harshness of life. We feel, we cry, we try our best. We allow ourselves to be permeated by what exists, because this, as much as the ability to control or affect our environment, is part of our highest potential. But I don’t know. I like to be effective. Don’t you?